The Canada Food Guide might have been free of industry influence. But it's just one part of the federal government’s “Healthy Eating Strategy.” There are two more battles underway as the food industry fights new labelling and advertising restrictions. The Canada Food Guide, released this week, might have been free of industry influence, but the great Canadian food fight isn't over yet. There are two more parts to the federal government's "Healthy Eating Strategy" — and that's two more battles the food industry is fighting. The food guide was just the first round. And during those deliberations Health Canada deliberately prevented officials from meeting with industry lobbyists, after facing years of criticism about food industry influence. The other two key pillars of the strategy have not yet been implemented: front-of-package labelling — to alert consumers when food contains higher amounts of salt, sugar and saturated fat — and restrictions on marketing unhealthy food to children. And Health Canada is being more open to input from the food industry on those issues than it was on the food guide. "I think that's fair to say. Certainly we're at the table having discussions with them, yes," said Michi Furuya Chang, senior vice-president of Food and Consumer Products of Canada (FCPC). The Canadian Beverage Association has also met with Health Canada officials to express its concerns. "We continue to engage with Health Canada to ensure the final regulations meet their objectives, without resulting in any unintended consequences," the association said in an email to CBC News. Meanwhile, supporters of the Healthy Eating Strategy are watching the calendar, worrying that time could run out on both fronts. With a federal election looming this fall, the clock is ticking. "That is absolutely a huge risk," said Mary L'Abbé, a professor of nutritional sciences at the University of Toronto who has participated in Health Canada's consultations on both issues. 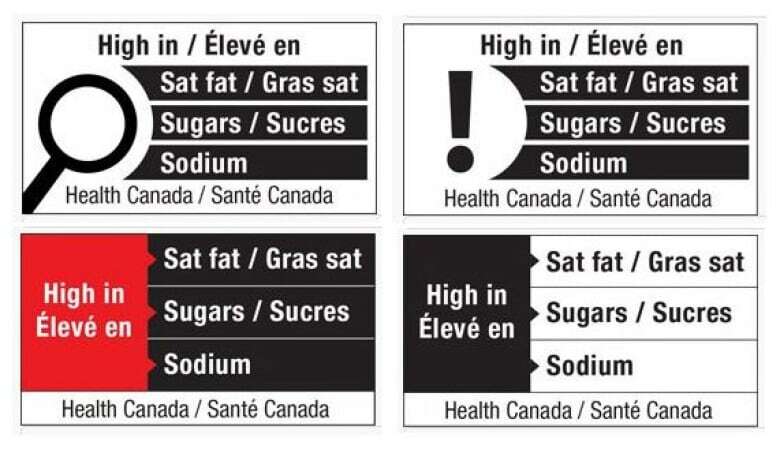 Health Canada's proposed labelling rules would force food producers to place a prominent symbol on the front of food packages — a visual cue that the food inside is higher in salt, sugar and saturated fat. "The majority of consumers don't turn packages over when they're in the store to look at the nutrition facts tables," said L'Abbé. 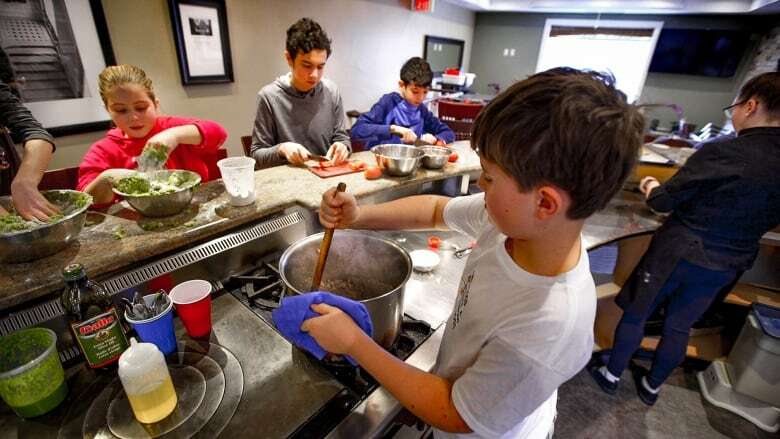 "The premise of the whole healthy eating strategy is to make healthy eating the easy choice." The food industry has been pushing back, arguing that the labelling will complicate trade and discourage the sale of some food products. "It isn't just providing the factual information, it's actually placing a value judgment on that individual food," said Chang. The final labelling recommendations are overdue — they were expected last fall. Health Canada told CBC News in an email that it "needed more time to analyze the extensive comments and additional evidence received through the formal consultation process." According to federal rules, if the gap between the proposed and final regulations is longer than 18 months, the consultation process might have to start over. "So if we don't see them published by June of this year, then the entire process will have to start from scratch," said Carla Ventin, senior vice-president at FCPC. The other battleground in the great Canadian food fight is happening at the Senate, where legislation to restrict advertising of unhealthy food to children is awaiting final approval. The Child Health Protection Act, (Bill S228) was introduced in the Senate two years ago by Nancy Greene Raine, the former Canadian Olympic ski champion. She saw it as a way to fight childhood obesity. "There's nothing in the food business that says what you sell has to be healthy," she said. "And if they're marketing to children with those products then it's simply wrong." 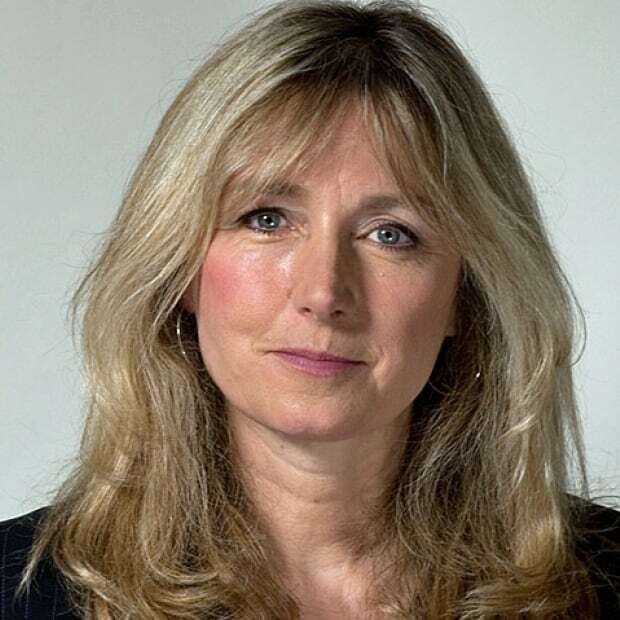 Her private member's bill became part of the Healthy Eating Strategy, passing all the legislative hurdles in the House of Commons. Now it's back at the Senate, where it's been stalled since June. "It's like it's flash-frozen on the finish line. It's got six inches to go and it's sitting there," said Greene Raine, who retired from the Senate last May. Since then she's heard senators are being heavily lobbied by the food and agriculture industry. "Of course I'm worried," she said. "I certainly don't underestimate that people in the industry don't like to see their business model interfered with, even if it hurts children. Food advertisers, farmers and even the National Hockey League have expressed concerns about the advertising restrictions. "It's intended to cover all forms of marketing including in-your-face sponsorship of kids sports," said Greene Raine. "A lot of people in the sports world don't support the legislation." After she retired from competitive skiing in late 1960s, Greene Raine did a series of popular TV ads for Mars chocolate bars. She said those kinds of commercials could be affected by her legislation. "If the advertising is targeting children, if it's on children's programming, for example." Health Canada said the next move depends on the Senate putting the bill up for a final vote. "The draft regulations cannot be published for consultation until the bill receives royal assent," the agency said in an email. "If they delay the vote, then I'm going to be looking and saying 'Who is pulling the strings here?'" said Greene Raine.